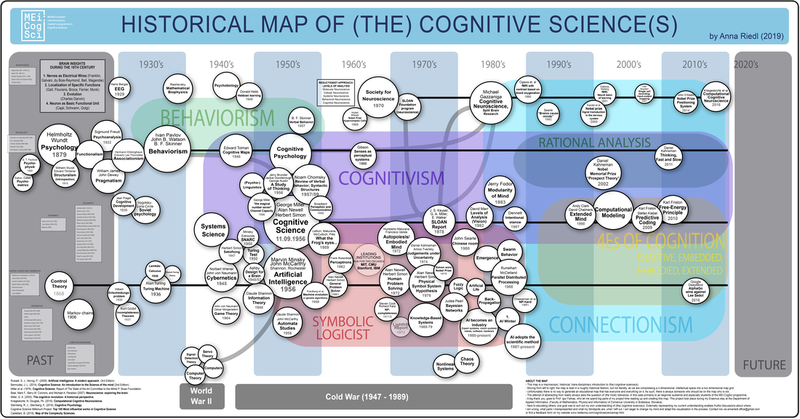 This map is a macroscopic, historical, trans-disciplinary introduction to (the) cognitive science(s). Moving from left to right, the map is read in a roughly historical fashion, but not literally, as we are compressing a n-dimensional intellectual space into a two dimensional map grid. Unfortunately there is no way to generate an educational map that has everyone and everything on it. As such, there is always someone who should be on the map who is not. The attempt of abstracting from reality always asks the question of (the most) relevance, in this case primarily to an beginner audience and especially students of the MEi:CogSci programme. Next to educating others, one goal was to sort out my own understanding of (the) cognitive science(s). Externally representing my current understanding enables fruitful discussions about where I am wrong, what parts I misrepresented and what my blindspots are, what I left out. I am eager to change my mind and adapt the visualisation in the process. Contact me via annariedl dot office at gmail or the feedback form below. Bermudez, J. L. (2014). Cognitive Science: An Introduction to the Science of the mind (2nd Edition). Miller et al. (1978). Cognitive Science: Report of The State of the Art Committee to the Advisors of the Alfred P. Sloan Foundation. Bear, Mark F., Barry W. Connors, and Michael A. Paradiso (2007). Neuroscience: exploring the brain. Chapter One. Miller, G. A. (2003). The cognitive revolution: A historical perspective. Kriegeskorte, N; Douglas, Pk. (2018). Computational Cognitive Neuroscience. Sternberg, R. J., Sternberg, K. (2016). Cognitive Psychology. Chapter 1.